It’s the ending of the old baktun and the dawning of a new one, and I’d like to greet both the new era and the return of the Sun on this Winter Solstice with the blowing of conch horns! The Aztecs named the conch shell trumpet quiquiztli, and the musicians who played them “quiquizoani.” This is the instrument that Quetzalcoatl played to defeat the devious challenge of Mictlantecuhtli, the Lord of the Dead, and reclaim the ancestral bones of humanity at the start of the Fifth Sun. I have seen some speculation that the “mighty breath” blown by the Plumed Serpent to set that newborn Sun moving in the sky was actually a tremendous blast on a conch horn. It’s the trumpet the priests played to call their colleagues to offer blood four (or five) times a night in the ceremony of tlatlapitzaliztli, and also during the offering of incense, according to Sahagun in the Florentine Codex . 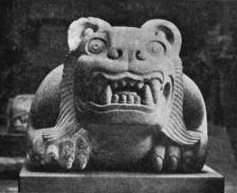 Tecciztecatl, the male Moon God, is sometimes depicted emerging from the mouth of a quiquiztli. The sound of the instrument itself was considered by the Aztecs to be the musical analog to the roar of the jaguar. Like the twisting spiral within the shell, the associations are nearly endless, doubling back on each other in folds of life, death, night, dawn, and breath. 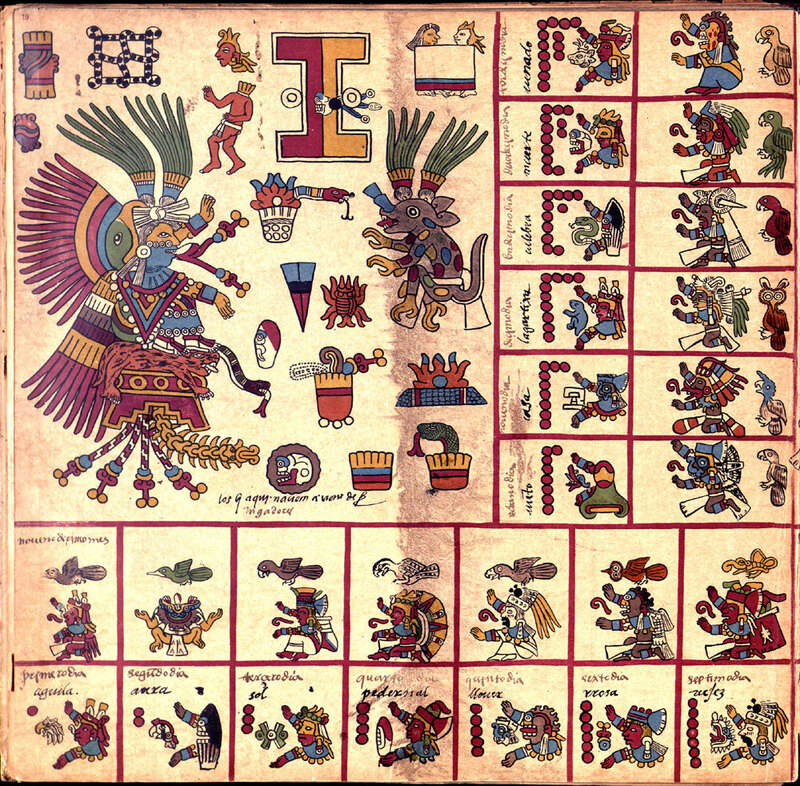 The quiquiztli appeared in two offerings at the Templo Mayor in Tenochtitlan (offering #88). One shell was found on Tlaloc the Rain Lord’s side (not at all surprising, given the overwhelming watery connotations of the instrument). A second one was found on Huitzilopochtli’s side of the manmade replica of Coatepetl. If you would like to actually hear one of these very trumpets being played, you can click HERE to visit the International Study Group on Music Archaeology’s page for these trumpets. You can directly download the MP3 recording by clicking HERE. I also found a beautiful photograph of an Aztec or Mixtec conch trumpet (covered in intricate carvings) currently in the holdings of the Museum of Fine Arts here in Boston. If you’d like to view the photo and see their notes on the artifact, please click HERE. If you’d rather jump right to the full-size, more detailed image, click HERE instead. Want to learn more about the trumpet and its uses in Mesoamerican cultures past and present? Head on over to Mixcoacalli and read Arnd Adje Both’s excellent 2004 journal article called “Shell Trumpets in Mesoamerica: Music-Archaeological Evidence and Living Tradition” (downloadable full text PDF). It gives a valuable introduction to the instrument in Teotihuacan, Aztec, and Mayan societies and includes numerous interesting photos and line sketches as a bonus. I couldn’t find a direct link to the article on his site, but I did find it on his server via Google. As a courtesy, the link to his homepage is here. There is some other interesting material relating to the study of ancient Mesoamerican music on there, so I recommend poking around. What about South American cultures? I’m a step ahead of you — why not go here to read an interesting article on Wired about a cache of 3,000 year old pre-Incan shell trumpets found in Chavin, Peru? Includes recordings and photos. Finally, if you’re curious for an idea of how the Aztecs and Maya actually played the quiquiztli, including how they changed the tone of the instrument without any finger-holes or other devices, you can view a demonstration by ethnomusicologist John Burkhalter below. If you noticed that the trumpeter in the codex image I embedded earlier has his hand slipped into the shell, you’ll get to see what that actually does when the horn is played in the video.